Why Does My Cat Sleep on My Feet? Why Do They Only Sleep at the Foot of My Bed? We all love when our cats get comfortable with us, especially at night when they choose to come to sleep with us on their own accord. 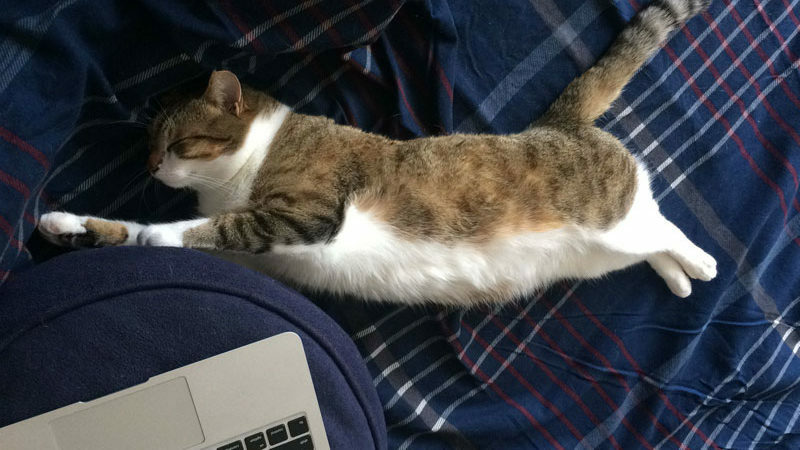 While not all cats like to sleep right beside or on their owners, the majority of cats will feel comfortable enough to sleep by the foot of their owner’s bed or on their owner’s feet. But why is that? As is with most things cat related, the reasons cats sport specific habits tend to come back to instincts that were developed pre-domestication. That being said, there are a number of reasons why cats find it preferable to sleep by their owners at night and you may be surprised by some of the reasons. Cats like to stay in packs and tend to be worried about their surroundings. It’s actually one of the most common reasons cats headbutt or rub themselves against you and sometimes even why they “make muffins” or knead you. Your cat may be sleeping at your legs to be able to quickly access you if there is a danger or threat. Cats, being light sleepers, will wake you up to either protect you or at least warn you dependant on the danger. You may also notice that some cats will choose to sleep under the blankets for added warmth and protection if they are extra scared. I DON’T WANT TO GET CRUSHED! Have you ever slept next to someone and they roll over in their sleep? Did they manage to avoid your arm, or were woken up with them crushing you? Well, if you were crushed imagine how much you could hurt your cat if you were to roll over onto them. This is actually why a number of cats also choose to sleep at their owner’s head as there’s a lower risk if their owner was to turn over. Your cat may actually want to sleep with you at night because you help them build a stronger routine or schedule. Since cats like to sleep for the majority of the day, they appreciate any time that they can spend sleeping next to their pet parents. 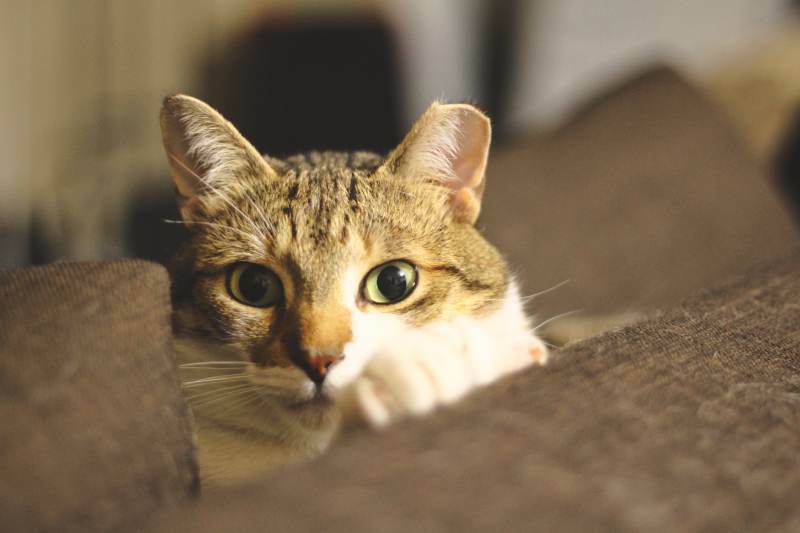 This ties into the first point of cats feeling safer while they are sleeping with their pet parents, making cats associate certain times of the night/morning as “extra safe” for long hours of higher quality sleep. Be ready for some rude awakenings if your cat wakes up before you and it’s breakfast time. Now, I don’t want you to start fighting with your partner over the fact that you may just be your cat’s favourite, but cats are known to sleep with the person who they feel the closest to. Lucky for us, our cats tend to sleep with whoever is sleeping, and oftentimes I get to sleep in later than my partner so… that person is me! Cats are territorial animals and have to know exactly what’s happening at all times. This is why kittens are always extra curious and you’ll find them seemingly bumping into objects or pushing their paws against their favourite spots. 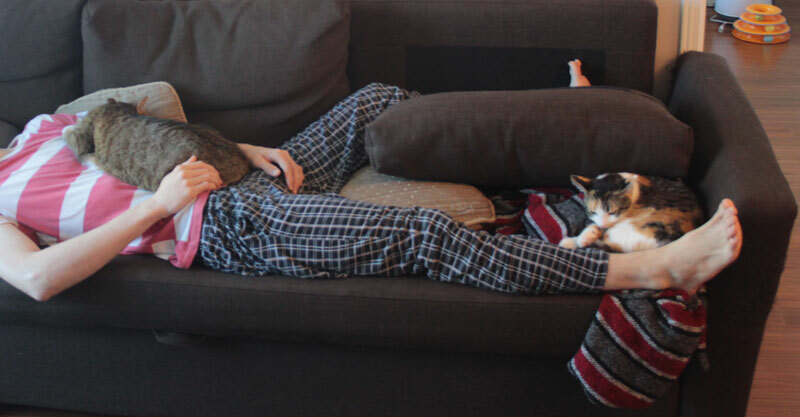 Cats do this as a way of marking places as “safe” or “secure.” This is also the main reason cats will choose to sleep on their owners, as it is a way of marking someone as their family or “safe”. Now, this isn’t to say that a cat will only be friendly with one member of the family. 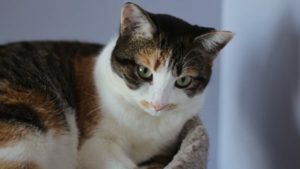 Cats recognize that a family can have multiple people and will be affectionate with multiple family members if the cat(s) feel like they are safe. That being said, it is not uncommon for a cat to sleep with multiple members of the family, seek attention from or play with any member of the family. They may, however, show a preference towards one member of the family. It’s not hard to guess that cats love to be warm. 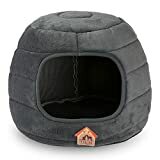 We have first hand experience with our cats loving wool cat caves, they love them so much that sometimes they even “fight” over them. Well, if you’re not a huge fan of cat beds or don’t have one, your little one may just be using you for the same person at night. Cats will most commonly sleep by their owner’s feet at night and by their heads in the morning. Sound familiar? 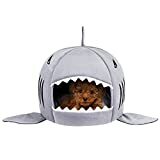 If you’re interested in giving your cat something warm to sleep in when you’re not in bed, I recommend checking out some of our favourite cat beds. HEY, BUT MY CAT USED TO SLEEP ON MY CHEST AND THEN STOPPED… WHY? As you can see from the picture above even though Beau is an older cat he will sometimes sleep on his dad’s chest. This is something you see more commonly in kittens, as they feel safer when they hear another heartbeat. Kittens will sleep very close to their mothers, especially while their mother is still nursing them. So, your cat is reminded of this period when they sleep close to your heart. That being said, some cats prefer to sleep close to their siblings, especially as they become bonded. So, if you’re ever in a situation where your first cat stops sleeping next to you and chooses to sleep next to their sibling instead you can breathe out a sigh of relief because it usually means that your cats are getting along. That all being said, kittens who experience shaky experiences sleeping on their owner’s chest (usually from rolling over, or their owner shifting at night) will usually begin sleeping at their owner’s feet as they adapt to make sure they get all the sleep they need. IS THERE ANYTHING TO WORRY ABOUT WHEN MY CAT SLEEPS AT MY FEET? Not really, you can just take it as a “you’re doing a great job and they trust you a lot.” Your cat feels very safe with you and there are no negative reasons your cat will do this. 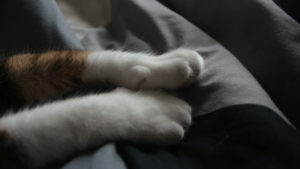 If you don’t want your cat to sleep by your feet anymore you can try to create a separate bed in the same room as you. 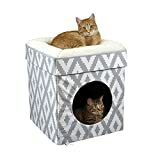 You can make this out of blankets and pillows, or you can check out some awesome cat trees or beds for your little ones to sleep in at night. 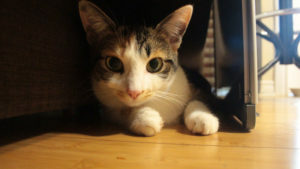 Whether or not your cat is sleeping by your feet daily or is sleeping by your feet every so often, it usually means that they feel safe around you. If you want to encourage your cat to sleep by your feet nightly you can try to pet them by your feet before you go to sleep. You can also give them a couple of treats by your bed to get them to associate your bed as a safe space. So pet parents I’m curious, do your cats sleep by your feet? Who is their favourite human? Let me know in their comments below! 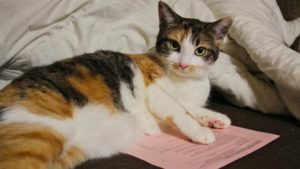 Why Do Cats Lay on Paper? Does Everyones? Why Does My Cat Chew on My Fingers? Is My Cat Hungry? I completely feel you on the sleeping in weird positions. My back hurts some mornings because of the awkward positions the cats and the boy make me sleep in so they’re comfy. Nutmeg sleeps beside/on my feet. Ginger likes to sleep mixed in with the clean towels or fuzzy blankets in the linen closet. Cats certainly have their own personalities. In our case though I’m the preferred pet parent even though my husband is retired and home with them all day. That’s adorable! I love it when they come to sleep with us, especially when I wake up thinking it’s one but it’s the other. Reminds me that they both love us, you know? That’s really interesting! Are you their main “food person” or is he? Very interesting!! My cat starts the night at my husband’s feet. Around 4am, he gets up to sleep on my pillow. Sometimes he stares at me and wants me to put my arm out on the pillow so he can sleep on top of it. Some of this makes more sense after reading your blog today. Thanks! !